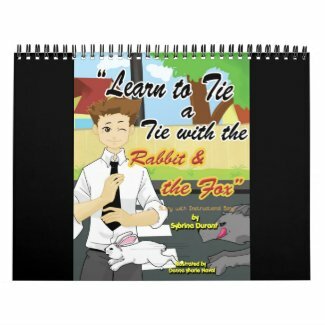 If you and your child enjoyed "Learn To Tie A Tie With The Rabbit And The Fox", please take a moment to write a positive review on the site where you found this ebook. As an independent author, I must rely on a little help from my friends to spread the good word about my books to others. So please, request them in libraries, schools and book stores in your neighborhood. Plus, discuss it your friends in person and online at great reading sites like Goodreads, Librarything and many others. You'll be amazed at all of the reading groups, looking for your input about different types of books. Your voice will make a world of difference. And please don't forget to let potential readers know how much you enjoyed the artwork by Donna Marie Naval. How about Librarything? If so, look me up and friend me on any of them. If not, check them out! You will be amazed at all of the reading groups, looking for your input about different types of books. Learn To Tie A Tie With The Rabbit And The Fox is not just for weddings. And it’s not just for boys, either. There are versions for boys and for girls. The book contains 24 pages of story, instruction and tie-a-tie diagrams plus the lyrics to the song. Listen to the story book version of the song for free by clicking the link in the middle of the top of this webpage above. Have You Seen The Original “Learn To Tie A Tie With The Rabbit And The Fox” Animated Song Video? Watch it below for Free. Buy the MP3 for the song in English language at Amazon. Or at Itunes. Other versions of the book are available in ebook, print and hardback. Click a link below for information about the book in English, Spanish or Tagalog, or the How To Guide For Older Guys. And check out these learn to tie books created especially for GIRLS Here & Here. The hardest gifts of appreciation to purchase are for the boys in the wedding party. Show the ring bearer, ushers and even the youngest groomsmen that you appreciate their participation in making your wedding special by giving them this little book before the ceremony. Even the very youngest will be proud to say, "I tied this tie myself." Include a warm note of gratitude on the inside cover from the bride and groom to make this a forever keepsake. If a child has mastered the tricky task of tying their shoe laces, they’re ready to have fun learning to tie a tie with the rabbit and the fox. This beautifully illustrated story book is based on the age old tale of a very hungry fox chasing a frightened little rabbit through the forest in pursuit of dinner! This book helps build self-esteem!. Click here to hear the accompanying song in English for FREE. Learn To Tie A Tie With The Rabbit And The Fox”.